Over the last two months I completed 20 commissioned illustrations. It was a lot of work, and by the end I was craving the chance to draw some personal work. But I didn't know what I wanted to draw. For moments like these I visit my Inspiration Pinterest board, where I collect any image online that makes me think, "ooh, I want to draw that!" I found this stock image from Deviantart. I didn't particularly like the model's pose or costume, but I loved the atmosphere of the forest setting. Ever since moving to the Pacific NW I've been thinking about forests a lot. 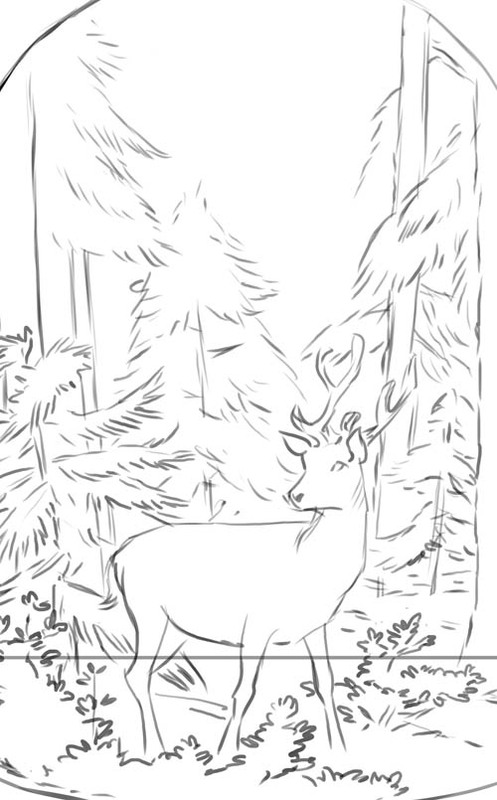 So what should I draw in the forest? 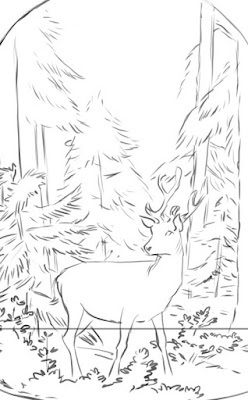 I don't know, how about a deer? 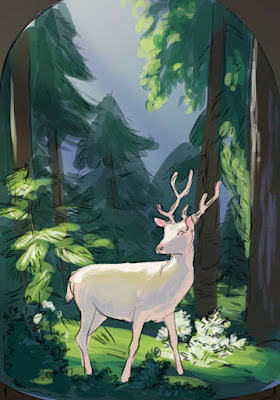 I love deer. Oooh, how about a mystical albino deer? 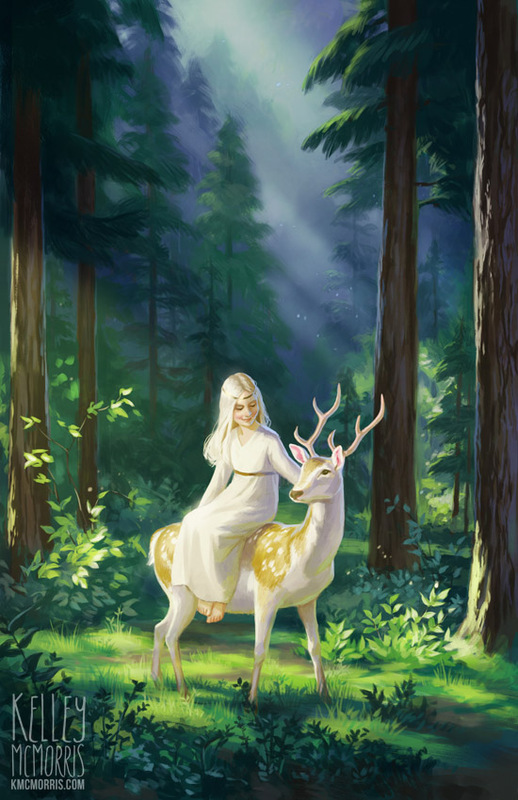 Mystical albino deer for the win! I started laying in some flat colors underneath the sketch. But I started to feel dissatisfied with the illustration. Something was missing. Something was boring. I considered abandoning the whole thing, but I've been doing that with too many personal pieces lately, and I was determined to work through this one. 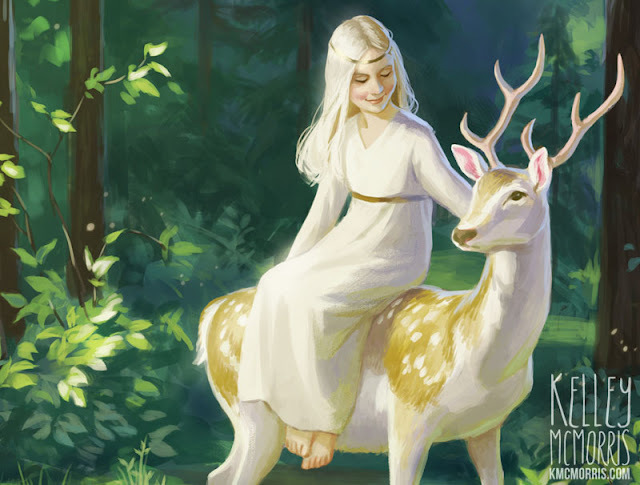 Then I tried drawing a little girl with white hair and a white dress on the white deer, and I loved it. Weirdly enough I considered calling the thing finished at this stage. "It's stylized," I told myself. "It's painterly." But a small voice in my head, the voice I have learned to recognize as artistic intuition, told me to take a break and come back later with a fresh perspective. While traveling over Christmas, I left my computer and this digital painting behind. When I got back, refreshed by a week of turkey dinners and holiday cookies, I saw that this painting wasn't "stylized" or "painterly," it was just a sloppy mess. It was time to tighten things up. 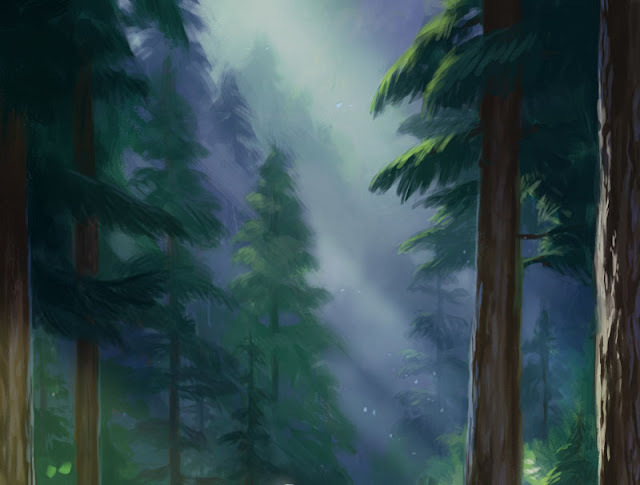 I tried to keep a bit of painterliness in the background trees. But wait, there's more! I tried my hand at making a very subtle little animated version. What do you think? I love this! And I love the title you gave it. It really is "pure" and beautiful. You have a beautiful mind and it comes through in your work. Thank you very much, Chelsea! :) It was refreshing to draw something that was simply happy and peaceful. 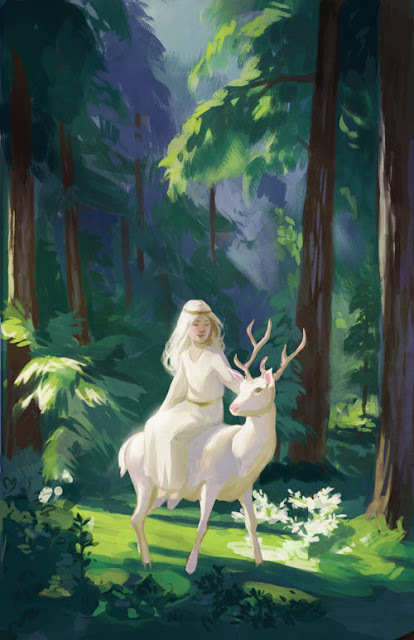 Beautiful and very sweet piece, and a great blog post :) I absolutely get caught in the dilemma of, "Is this actually finished or do I just feel done?" It's especially tough when you're trying not to over-render. Love the serenity of this piece. It's refreshing to see a warm spring forest in this dull winter. 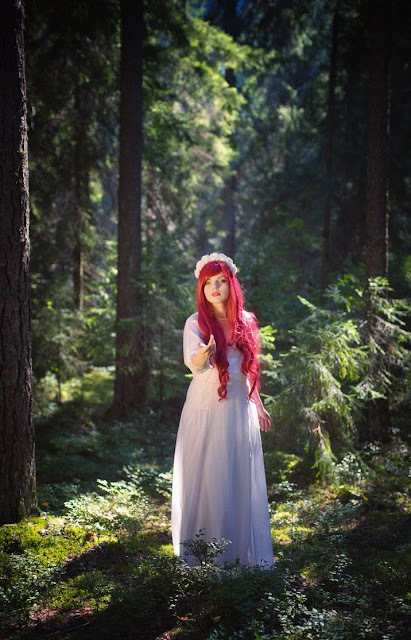 I enjoy all of your work, but your personal works are truly magical. Wow. Your work of art is awesome!!! I was in absolute awe when I first saw this. I love that you share how you make all of these inspiring works, it's amazing to see!